There’s plenty of things for Avon, Indianapolis, and Plainfield drivers to love about the Toyota RAV4. It has a stylish design, ample safety features, and enough interior amenities to keep you satisfied during those long road trips. 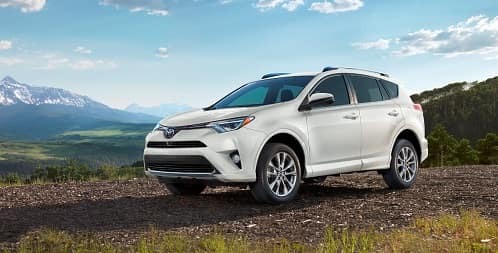 The 2019 Toyota RAV4 also offers six different trim levels, each building on the high points of its predecessor. Check out this review by the Andy Mohr Toyota team to learn what each brings to the table. As the first trim level for the this model, the Toyota RAV4 LE sets the stage for the rest of the lineup. It starts off strong with a 2.5L 4-cylinder engine under the hood. Paired with a 6-speed automatic transmission, this powertrain can produce 176 horsepower and 172 lb-ft of torque. These features pair well with other included interior technology, such as Entune™ Audio and the backup camera with projected path static lines. The former provides smart entertainment, while the latter provides a convenient view of what is happening behind your vehicle. The RAV 4 XLE trim has a lot of similarities to the base trim. However, it does add on some nice features. For example, the interior now comes with amenities like dual zone automatic climate control, which adds more nuanced temperature controls. This system can keep two different passengers happy at once. The leather-trimmed steering wheel now comes with mounted audio and Bluetooth® controls. With this feature, you can operate your favorite devices without having to take your hands off the wheel, ramping up the safety. The 6-way adjustable driver’s seat is then trimmed in fabric. In this iteration, it comes with sport bolsters for added comfort on long drives. With a name like “Adventure,” more rugged features are certainly expected—and you won’t be disappointed. The Tow Prep Package is standard in the Toyota RAV4 Adventure trim, which allows you to easily hook up your trailer. The total towing capacity even receives a noticeable boost! Black roof rails adorn the top of the vehicle. Feel free to pile on a kayak or some added luggage for your next big camping trip. Inside the SUV, you’ll have heavy-duty Adventure all-weather floor liners and cargo mats. These should protect the interior from the messy elements you might encounter. You’ll notice quite a few interior upgrades when you choose the 2019 Toyota RAV4 SE trim level. First and foremost, you’ll now have Entune™ Audio Plus with the Connected Navigation App. This system includes GPS directions and real-time traffic updates to help you get where you’re going without missing a beat (or getting stuck in a jam). Steering-wheel-mounted paddle shifters are added to your controls, so your hands rest comfortably on the wheel, even when you need to switch gears. Also, you’ll already be extra comfortable, as you’ll now have a SofTex®-trimmed 8-way power-adjustable driver’s seat with power lumbar support. This seat comes with sport bolsters and heating for total comfort. Even more conveniences become available in the RAV4 Limited, starting with the Smart Key System. This feature allows for keyless openings on the front doors and liftgate, as well as push button start. No more shuffling bags around to get to your keys! Your frameless auto-dimming rearview mirror now comes with the HomeLink® remote system. Not only does this allow you to open your garage door on approach, but you can even sync it with certain home appliances and lights. Turn them on before you even walk through the door! If you’re impressed with that technology, then you’ll like the safety add-ons in the Limited. The Blind Spot Monitor and Rear Cross-Traffic Alert can be a huge help when changing lanes, as they’ll alert you when vehicles are following you in those hard-to-see spaces. At the top of the trim level totem pole, the Toyota RAV4 Platinum has some truly impressive features to offer. Music lovers will appreciate that Entune™ now comes with Premium JBL® speakers. This cranks up the wattage by the hundreds. Feel free to turn up that dial! Small touches, such as the ambient footwell lighting and the driver’s seat memory system, add homey, comfortable vibes to your SUV. Meanwhile, the high-tech feel is enhanced by the front and rear parking sonar and Bird’s Eye View Camera with Perimeter Scan. Parking has never been easier than when these features are doing half the work for you. Which Toyota RAV4 trim level do you think would best suit your Avon, Indianapolis, or Plainfield lifestyle? The best way to know for sure is to get behind the wheel. Contact Andy Mohr Toyota to schedule your test drive today! By submitting your information, you consent to Andy Mohr Automotive Group contacting you via phone, email and/or text message to the number or email address you have entered. You do not have to consent in order to obtain any of our products or services. Message and data rates may apply. Andy Mohr Toyota	39.7632877, -86.3630827.